The Vamps are back with the latest single from their breakout album ‘Meet The Vamps’. 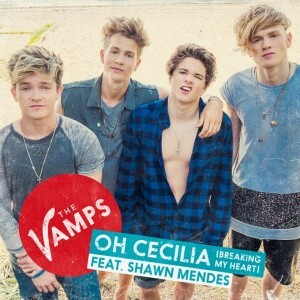 We presume that most of the band’s fans would be too young to have any idea who Simon & Garfunkel are – or that the boys have sampled their 1970 single ‘Cecilia’ on their latest single ‘Hey Cecilia’, on which they rope in the extra vocal services of Canadian singer Shawn Mendes. “Some exciting news coming for Australian fans soon,” it reads. No doubt more details on the “exciting news” will be forthcoming in the weeks ahead and naturally, we’ll keep you across developments.